While in America John Wesley compiled a hymnbook called A Collection of Hymns and Psalms which has come to be known as the ‘Charlestown Hymnal’. The inspiration to compile this volume probably came to John from the hymns he heard being sung by the Moravian and Lutheran refugee Christians of Savannah, Georgia, USA. It contained 70 texts (21 metrical psalms and 49 hymns), although some of the longer ones were divided into stand alone sections, which meant that there were 78 items in total. 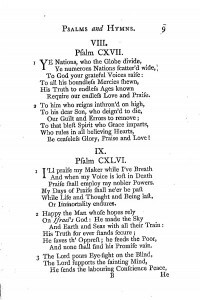 Wesley included hymns by, amongst others, Issac Watts his father, his older brother Samuel, and George Herbert. Also included were translations of Spanish, German and French hymns. Only two original copies from 1737 survive: one is kept at the John Rylands Library, University of Manchester; the other is held by the New York Public Library. 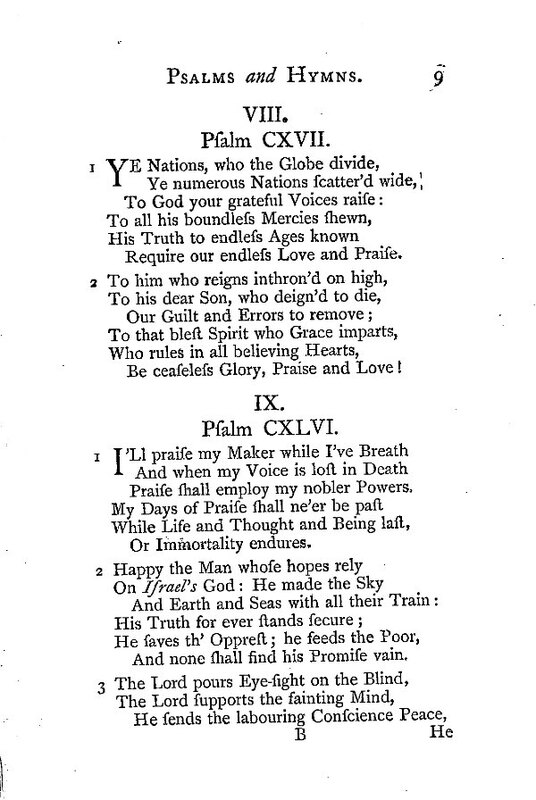 A hymn included in this hymnal which is still widely sung today is Isaac Watts‘ hymn ‘I’ll praise my maker while I’ve breath’.